To use HLD-NAC you need two key parameters: the Cc of the surfactant and the EACN of the oil. If they are known, that's great. If they aren't then you have to measure them. Fortunately, measurement is not at all hard and can be done in a number of complementary ways. The apps show you not only how to do the measurements but what you will see in your test tubes! There are four types of measurement that are vital for HLD to flourish. They are discussed in turn. The relevant page gives you an app to help you carry out the EACN and Cc scans. But first some necessary preliminaries. All measurements are done via a "scan" where a range of formulations is tested in the hope/expectation that one or two of the formulations will show the characteristic switch from Type I to Type II, at which point the HLD=0 so the unknown in the HLD equation can be calculated. As we shall see, there is an inevitable trade-off between the amount of effort expended and the accuracy of the result or, even, whether any result is obtained. A scan for EACN in 10 steps of 0.5 will give an accuracy of 0.5, but if the scan starts at EACN=5 then it ends at EACN=10 so that an oil with an EACN of 4 or 11 will be missed altogether. A scan of 10 steps of 1.0 starting at 2 will end at 12 so will catch either of those "missed" values, but at the cost of a lower accuracy. Of course, if 20 steps were used in the first case, starting from 2 then a bigger range is covered at higher accuracy but at twice the cost in time and materials. The ideal is to have a good starting guess and/or the combination of a quick "scouting" scan followed by a smaller "accurate" scan. The same consideration exists for Cc scans. The good news in 2016, however, is the publication of the Fast Scan method from the Acosta group which means that the whole process may, in many circumstances, be carried out much faster. We are looking for pure microemulsion effects in these scans - thermodynamics, not kinetics. In fact, all we want to see is a flip across a small range of tubes indicating a transition from Type I to Type II. In principle, therefore, all we need to do is mix the test ingredients with the minimum of shaking, let them settle into their thermodynamic state and observe the results. With the right choice of test surfactant(s) and oil(s) this ideal can be approximated, though it usually needs the assistance of something like a centrifuge to speed up the destruction of any macroemulsion phases that have been introduced by the gentle shaking. However, it can sometimes happen that it requires vigorous mixing to allow all the components to have a chance to reach their thermodynamic state. AOT, for example, might require vigorous shaking to allow it to "dissolve". In this case it can easily take a day for the phases to separate out, and perhaps some strong centrifugation or a heat step might be required. For hyper-efficient so-called extended surfactants the separation can take months. In that case a "neutral" alcohol such as sec-butanol is used. This speeds up the kinetics of separation whilst (unlike other alcohols) having no significant effect on the calculated values. It does, however, tend to reduce the efficiency of the surfactant so phase volumes are smaller and harder to measure. There is one other major decision to be made. How much (total) surfactant to use. A high % (say 10%) will give very strong differentiation of the phases, making it easy not only to identify the Type III transition but also to measure phase volumes that can provide important extra information. But high % of surfactant can also lead to ugly mesophases that refuse to separate and therefore make it difficult to identify the Type III point. Low % surfactants are likely to lead to cleaner separations, but the effects are more difficult to spot. In practice, finding surfactants that aren't prone to forming mesophases is a key part of a successful scan strategy. Quick checks in the EACN range(s) of interest can reveal whether the surfactant(s) are happy enough. Over time, a team quickly builds up a repertoire of oils, surfactants and % to cover most relevant situations. Scans assume a 50:50 oil:water mix. The most obvious scan is to take a, say, 10ml flat-bottomed tube and use, say, 4ml each of oil and water. This gives plenty of space for mixing, many tubes can fit into a centrifuge, storage space for the scans is easy to find, it is easy to take a photographic record of clusters of tubes and the whole system fits nicely into a robotic (high-throughput, HT) system. There is a human element of judgement in this technique (which may or may not be a bad thing). A more unambiguous technique for classifying the different phases is via a conductance probe - the w/o phase is easy to spot from its low conductivity. Another trick is to use (different) coloured dyes for the water and oil phases as it is straightforward to distinguish between, say, balls of aqueuous dye suspended in oil from a continuous phase of aqueous dye containing oil. One important tip is to arrange for lots of neatly printed labels for the tubes. Scans tend to generate lots of samples which sometimes have to sit around till equilibrium is reached and poor labelling can create lots of confusion. When pictures are taken of the scan (a very important way to capture lots of subtle information), clear labels are most useful. It takes some effort to find ways to take good photos. You need to see many tubes at the same time, they need to be in nice, fixed positions, they benefit from a background that shows some regular grid to allow easy visual measurement and the photos need to be taken both front lit and back lit as each view can bring out different features of the scan. For front lighting, a flash is a bad idea - the glare gets in the way. For back lighting a high-quality diffuser is needed to give an even, featurless background. Once a good photo set-up is arranged, it is quick and easy to get great shots of the phases. It just takes a little time to get the best arrangements. Whatever the reason, without a knowledge of the EACN of the oil, accurate formulation is impossible. Measuring EACNs in the range of, say, 6 to 16 is relatively straightforward. Outside that range, a little more imagination is required to pin down the EACN accurately. Start with two nice, simple surfactants, the first of which would give a Type III for an oil at the bottom of the range and the second gives a Type III at the other end of the range. Each step in the scan represents a mixture of the two surfactants which would give a Type III for that EACN. Because you get to choose the salinity (and in principle, though rarely in practice, the temperature) a given pair of surfactants can cover a reasonably large range. A pair of ionics is in principle more versatile because the salinity effects are much larger, but as we all know, high salt concentrations can cause complex phases to form that interfere with a scan. A lab that needs to do lots of EACN scans over a wide range of oils needs several reliable workhorse pairs of surfactants. A typical example of a bad pair is SLS and AOT because these are notorious for forming complex phases between them. Another issue is convenience. AOT happens to be an excellent ionic surfactant for high EACN values, but is generally hard to weigh and its insolubility in water makes it hard to add from an aqueous stock solution. Choose a single known surfactant and a known oil which does not give a Type III with that surfactant. Now scan with different ratios of the two oils. If a Type III is found then the EACN of the oil mix can be calculated and from that the EACN of the unknown. Choose a single known surfactant and scan over a range of salinities. The EACN range scanned with an ionic surfactant can be larger as the effects of the salt are more dramatic, though the salinity of the surfactant itself complicates the analysis. There are three methods for general methods. Take two known oils that span the desired Cc range at your given salinity (and/or temperature). A typical pair might be Toluene with a Cc=1 and Hexadecane with Cc=16. For a non-ionic and a convenient 0.5g/cc salinity, this represents a Cc range of ~0.1 for Toluene and 2.7 for Hexadecane. If your scan fails because the Cc is smaller than 0.1 then by adding extra NaCl to the first tube in steps of 0.5g/cc then if the surfactant is unaffected by salt up to, say, 5g/cc then a Cc of -0.5 might be captured. With ionics the shift in the lowest Cc can be even larger. If the scan failed at the top of the Cc range there is no alternative but to create some new mixes, e.g. between Hexadecane and Squalane which has an EACN=24. Take a known oil in an appropriate part of surfactant space then scan using mixtures of your unknown surfactant and one with a known Cc. 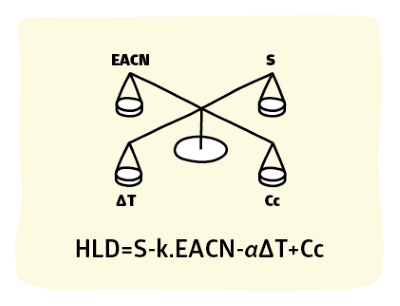 If your unknown matches an EACN lower than your oil and the known matches an EACN higher, then at some point you will find a Type III from which it is possible to calculate the Cc of your unknown. Make up tubes with your surfactant/water and into each tube add increasing amounts of NaCl. When the salt is dissolved, add 50% of a known oil. This "salt scan" is useful (as noted above) if you know that you are close to the Cc with an oil scan. It is also popular in academic studies for getting accurate values for Cc as the salt concentration can be adjusted easily. There is no need to re-measure the EACN of a pure oil. But for cosmetics applications, for example, there can be considerable variability in a an oil: One Jojoba oil may not necessarily be the same as another. The fascinating fact is that in terms of formulating with such an oil, the EACN re-measurement is a superb QC tool. A change in the ratio of alkyl chain lengths or degree of saponification can very readily be picked up by this measurement. Or, rather, a significant change can be picked up - significant in terms of the formulator who has to handle the oil. It makes no difference to the formulator if the changes to the oil have no impact on its emulsification properties. But a change which affects the EACN will probably change the emulsification properties. Because the approximate EACN is known a QC scan is very easy to set up. 6, say, stock solutions of surfactant blends around the known EACN can be prepared ready for many QC tests. These 6 solutions are simply mixed, 50:50 with the oil. If the standard oil has a Type III change in tube 3 then a change in tube 2 or 4 will indicate that the EACN has changed. Most of us cannot afford to pay for pure surfactants. Instead we accept that our surfactants are complex blends. This means that their Cc values can change from batch to batch. In general, suppliers have little knowledge of whether the inevitable changes they see in their chemical QC tests are of any relevance to formulators. But by measuring the Cc of each batch they know immediately whether the change is significant or not. More importantly, by having stocks of batches at the extreme of the Cc range, it is rather simple to add a high Cc portion to a batch that is below the Cc specification or a low Cc portion to a batch that is too high. This should be standard practice in the industry. As with the EACN QC measurement, a simple set of stock solutions, based on either the two oil scan or the known Cc scan, can be used to rapidly check whether a batch is in specification or not. The most obvious problem is when you do a scan and all the tubes look the same. This means that the initial estimate of the likely value was wrong. The answer is to find some method for a quick scan across a larger space in order to get a better first guess. The next common problem is mesophases. If the surfactant finds itself in some ordered liquid crystalline state it can take a long time for it to settle out to the thermodynamically stable state which makes it easy to identify the Type III transition. Sometimes adding a few % of sec-butanol can reduce the tendency to form such phases, without significantly altering the Cc or EACN values. Alcohols can be included in HLD but there is insufficient data to make it routine to account for the effects of small alcohols, though methanol to propanol tend to shift things into the w/o zone and pentanol upwards shift things in the other direction. The problem is with higher alcohols. Are these oils, surfactants, hydrotropes, co-surfactants or what? The answer is that the surfactant world is shockingly ambiguous in its terminology so the answer to that question is "most of the above". The world of cosmetics ingredients creates some real puzzles. Is a mono or diglyceride (perhaps with some EO chains) an oil or a surfactant? Sometimes the answer is that it's a good oil and bad surfactant, sometimes it's a bad oil and a good surfactant and sometimes it's both. In general glycerides pose measurement problems. But this is a good thing!. Working on glyceride scans helps the formulator to better understand how a given ingredient will behave in a formulation. If an experiment shows that the ingredient behaves more like a surfactant than an oil (or the other way round) that is an important clue for future formulations. Further confusion comes from "hydrotropes". This word has many meanings - varying from "behaves like an alcohol" to "is a real surfactant" (in a cosmetic formulation it's nicer to say you have a nice hydrotrope rather than a nasty surfactant). Again, the confusion can be turned to an advantage. By trying to measure a "hydrotrope" it's possible to work out what it is really doing - is it an alcohol, is it an oil, is it a surfactant? It's important to know.